I sigh at the experienced riders in the arena. I'm sitting atop my own horse, Amazing Grace, watching the awesome riders in the ring. I'll never be that good. I don't even know how to ride! "NO! SLOW DOWN DAKOTA!!!" A girl riding a very tall grey mare screams. Her horse is barreling across the arena-- right at me and Grace. I hear a loud shriek coming from close by. Then I realize that it's my horse. She rears up high, but I don't fall off. I so wished I had fallen off. What happened next was the worst. 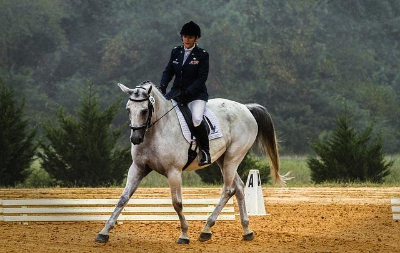 The girl and her horse, Dakota, slam into Amazing Grace's side. I fall off and try to move away, but I'm too late. Grace falls onto me, and Dakota tramples me. Her rider lay motionless, far from where she was when she slammed into me. A few people crowded around her. Didn't they realize I was here? One girl does. She's standing right above me. She has long brown hair and she's wearing a white dress. Another girl rushes over to me. "There's another girl over here!!" She yells. There's a lot of commotion. "CALL 911!" "GET HELP!" "DON'T LET THEM MOVE!" "GET THE HORSES AWAY!!" And then I black out.